Window shopping for dining room chairs has always been fun and easy. I’ve filled Pinterest boards with different inspirational dining rooms and chair options, But of course, now that I’m actually ready with an envelope of real, live, dirty greenbacks, I can’t make up my mind to save my life! Why is it so difficult for me to decide on dining room chairs? I have completely changed my mind from the last time we discussed this. I think I’m having commitment issues. But like I said before, if we’re going to get new chairs, I’d really like them to be chairs we’ll have around for a very, very long time- if not forever! You guys brought up a good point, though. If we’re going to invest in forever chairs, I probably shouldn’t be crunching number so tightly. What’s a few more hundred dollars for a real dining room investment? (I’ll tell you what a few hundred dollars are- they’re about half a year’s worth of home improvement savings!) But I’ve decided to wait to take the dining room chair plunge, and really settle on a set that we truly love. 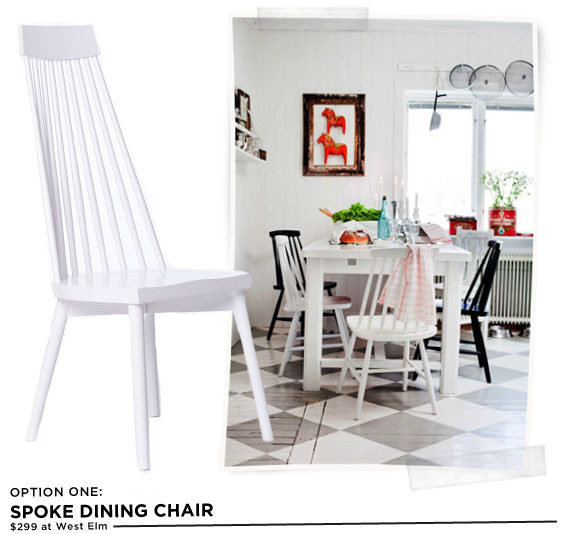 Here are the top contenders right now- of course, the one I love the most (this white spoke dining chair) is the most expensive. But I’m crossing my fingers for a sale. 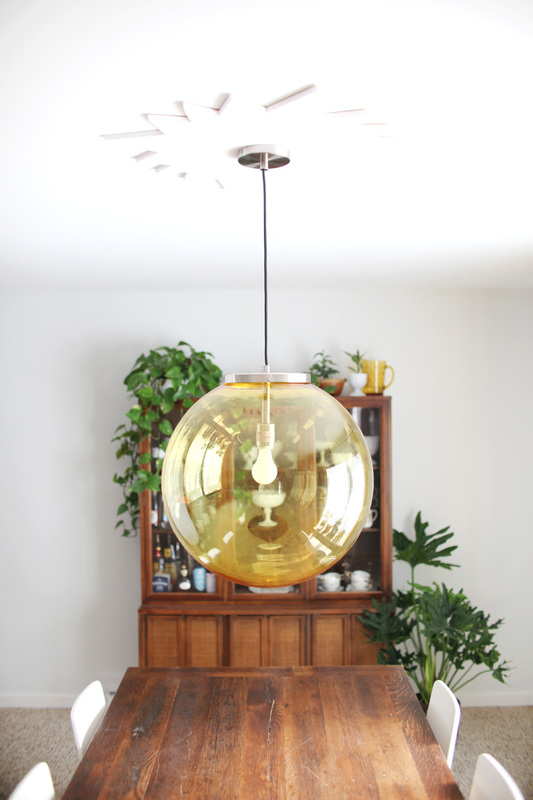 Oh- and while we’re talking about my dining room improvements, check out this ceiling medallion DIY I shared at A Beautiful Mess today! I love this spoke dining chair from West Elm, because it has the traditional feeling of a spindle-back windsor chair, but the tapered style of the back lends the chair a bit of a funky vibe. It would be easy to wipe clean, and its more substantial size would stand up well against our large farmhouse table. This chair is a winner- but we’ll be saving quite a bit longer to take home a set of six. The idea of having a grouping of these Panton style dining chairs alongside our rustic farmhouse table seems like a perfect contrast to me. I love the sleek style and mod design of these chairs, but they are a bit bulky, visually speaking, and the knock-offs that I actually can afford (The originals are more than $300, and I prefer the West Elm chair for that price.) have this weird webbing behind the curve of the seat, to give the weaker material extra support. The chair really doesn’t look so elegant with the webbing, so I’m not so sure I’d like to have the Panton knock-offs lined up in a row at our dining room table. Maybe somewhere else in our home? This modern sleigh chair reminds me of a cross between the Panton chair above, and the gorgeous Saarinen tulip chair that I shared in my last dining room chair post. I love its sleek and mod vibes, and that it’s much airier that the clunky looking Panton chair. The cushion can be removed for cleaning and even recovered- which would be a great way to change up the look and add pattern to our dining room. 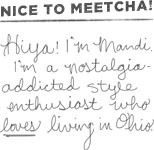 But I’m just afraid that this style is such a statement that I’ll grow tired of it as the years progress. Also, would its small frame not work well with our bulky table? And could I ever commit to such a funky chair? I’m just not sure! So what do you all think? I have a while to think about all of our options, because right now we’ve decided to save for six of the West Elm spoke chairs (option one), which will take a bit of time, unfortunately. Waiting is so difficult sometimes, but at least when the time comes, I’ll know with confidence which chair we want. Or will I? Image sources: first dining room image by Lena Ostling for Hus & Hem via Bright Bazaar Blog, second image by Barry Calhoun for Style at Home, last image by Daniel Mahon of Kirra Jamison & Dane Lovett’s home via The Design Files. Dining room chairs ARE a big deal! I like all the contrasty ones you’ve chosen, especially the first and second options though. When in doubt, I always go with West Elm. I love those spoked chairs! I’m a sucker for anything that’s country-modern. I think you answered your own question. You want the first ones. I think you’ll never tire of the 1st ones. Like the medallion too! Random…but do you think the spoke chairs are something you might be able to find at an amish furniture store? They might have something similar and even unfinished that could save you a lot of money! This is totally not random! haha! I asked my mom the same thing. I mean, it’s just a quick 20 minute drive to Amish country. We should check it out. I see them definitely having windsor chairs that aren’t tapered like this West Elm version, but I’d be surprised if they had something a mid more Scandinavian like these. Also, they might not be less expensive- those Amish shops aren’t cheap. Still- worth a look! It would be a fun weekend thing to do with the bitty fam! FIRST ones all the way:) I think they would be around for a very long time!!!!! AND you nailed it for me when you mentioned you want them around for a very long time. I truly believe “main” furniture like a dining room set, or bedroom set you really GET what you pay for. I remember bedroom shopping a few years ago and so many styles really caught my eye. WELL my husband really investigated the furniture (yes got down on hands and knees looking at the bottom and every angle of the bed) you can see how cheaply they make furniture today. SO when the price looks not so bad there is a reason. Good quality furniture is expensive no matter how you look at it!!! the first one is a great design and a great choice! you’ll never get tired of it! the abs version of the panton chair you linked before it’s on sale on their website at only 62$ (obviously you’ll have to consider the shipping and the taxes, but still seems good to me) I bought from them the DSW chair in ABS because the one made with fiberglass tend to be too delicate and my husband, who wears usually a kind of jeans with sharp details,will ruin and scratch the chair in no time. (we got one in fiberglass for our office and that’s why I know this little detail ;)) we got 4 of the ABS for the dining room and they’re comfortable and cute. Plus I have to say, cheap :) hope this link can help you! Thanks for the suggestions! I’m obviously not against buying vintage furniture- as you can see in my home posts, we have our fair share. :) But I’d definitely like to get a brand new set that will be in tip-top shape. Also, I don’t think I want anything upholstered because of cleaning or having them rip or whatever kids (or me- with my DIYing on that table all of the time) might do to them. Also, I’ve pretty much ruled out the tulip chair, even though it was my top choice for a while, because they’re not the easiest to move in and out from a table. Loving the second or third option! Whaaaat?! Panton chairs are now $300? We bought these chairs for our dining table back in 2007 from DWR and do you know how much they cost back then? $120 each plus an extra 15% off because it was the Dining Sale! Wow, I can’t believe the price has gone up 250%… Well, I can attest to their durability and comfort; it’s been 7 years and they still look as new as the day we got them. 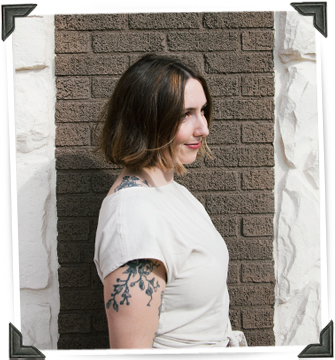 Option #1…look comfy, classic style with enough of an edge that you won’t grow bored of. 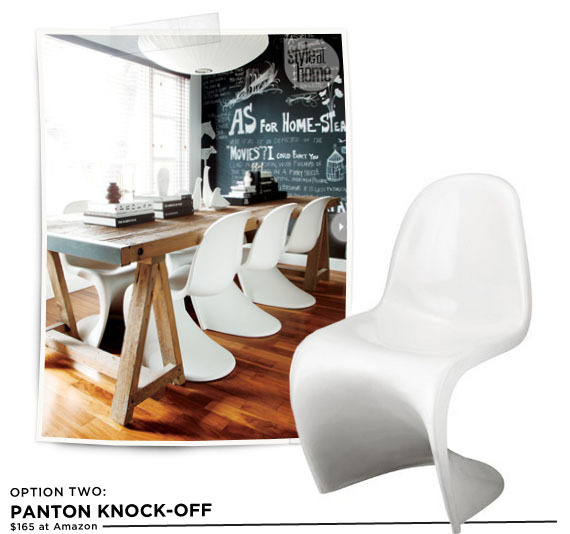 Option#2 – Panton – all I can think of is having a sweaty back from sitting in them too long! Good modern contrast to the table. Option#3 – more ventilation – ha! cool look and like that they can be cleaned easily. Are they too space-agey for a farmhouse table? I like option 1 personally but I am not the one who has to sit in them, see them every day and the most important point, pay for them. Go with what your gut tells you. these are all so good! especially the last one. 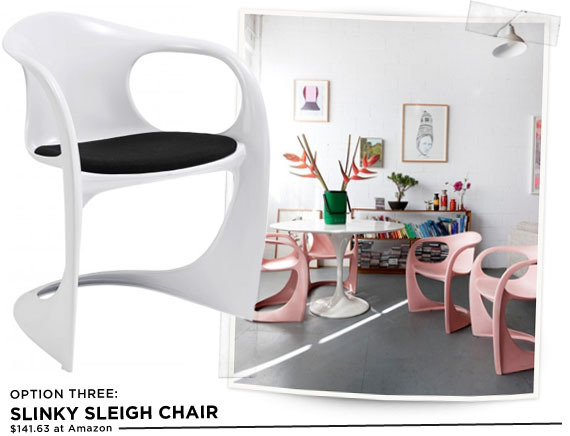 check out the salt chair at dwr… similar style for $200 less. also the new ikea trendig chairs – there is a spindle version and a more expensive wishbone style. Hey! Idk if you are still in the market for dining chairs or not… But I recently sold my old ones and am thinking about getting these in my complicated quest for new chairs. And a good deal too! We’re looking for a new sofa, and I remembered how much I loved yours. Just curious how it’s held up with a little one. Is it still comfortable? It’s held up well! It’s not uncomfortable, though I noticed when I was having back problems for a while there (during pregnancy and when I threw my back out last Fall) it wasn’t as comfortable as other nicer sofas I sat on during the time. Still, it’s great for the price! The fabric has held up well and the cushions too.